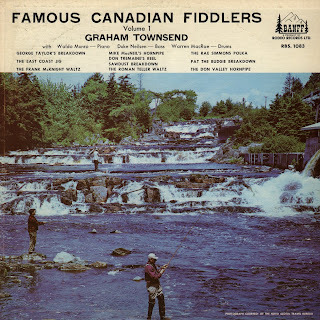 With this post, I have finally wound my way back to Townsend's first LP on the Banff label, RBS 1083 from 1960, "Famous Canadian Fiddlers Volume 1". 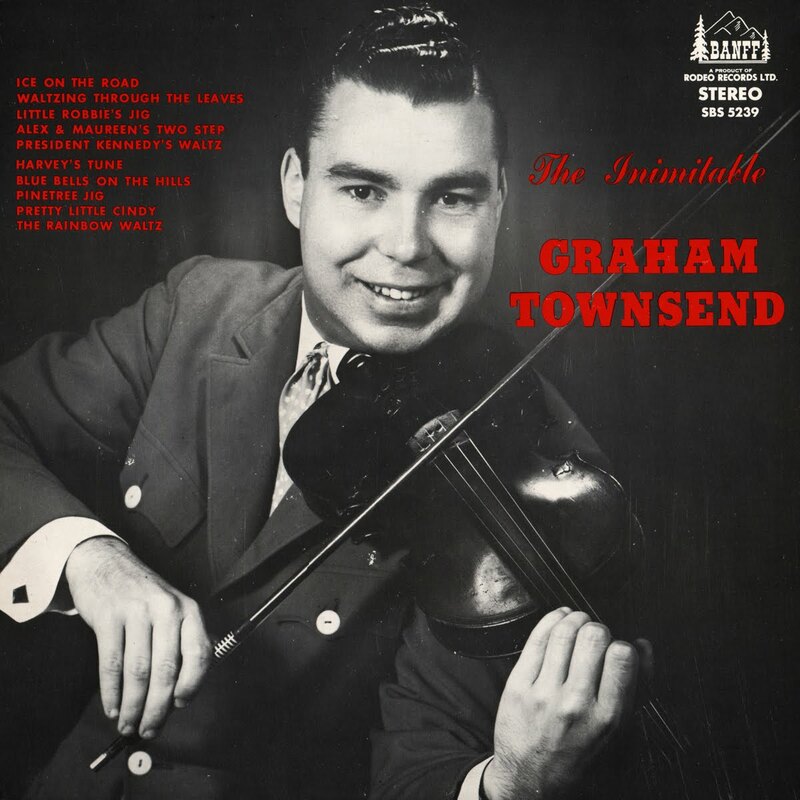 Nine of the album's ten tunes are Graham's compositions, the tenth composed by fellow Shelburne champion Victor Pasowisty. 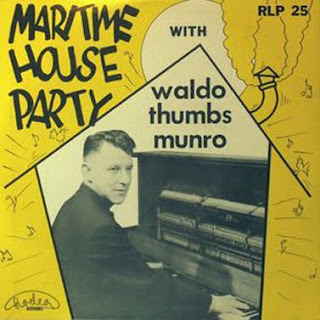 Like RBS 1116, accompaniment is provided by Waldo Munro, Duke Neilsen, and Warren MacRae, all members of Don Messer's Islanders. 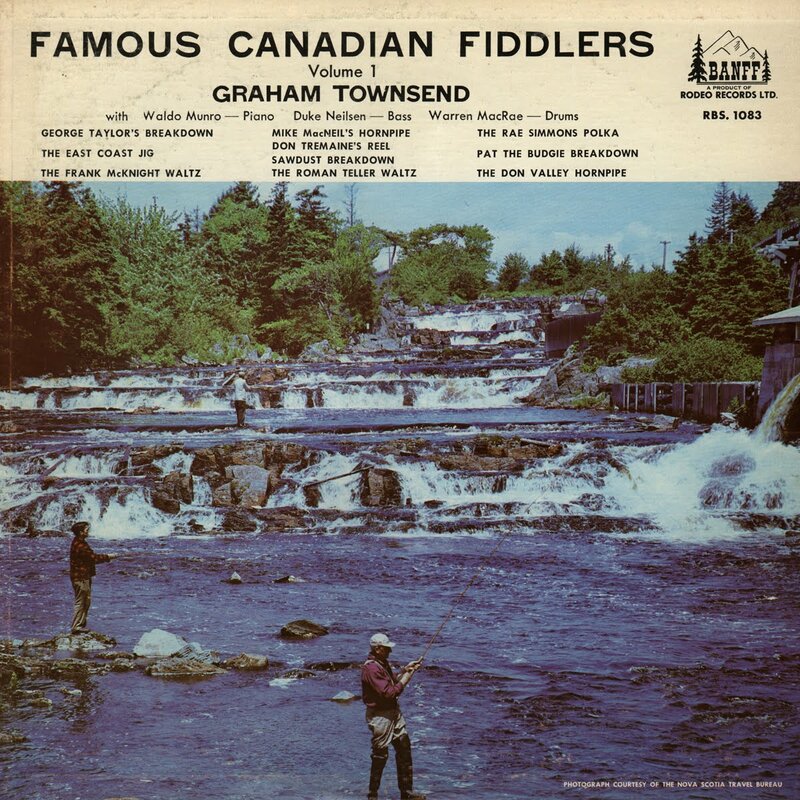 Incidentally, the only other "Famous Canadian Fiddlers" album issued was Volume 2 by Joe Murphy and His Band, RBS 1084 (a reissue of Rodeo RLP 14). A two part video of Graham and his wife Eleanor's set at the 1994 Cobden fair in Cobden, Ontario is here and here. Graham Townsend's second LP on the Banff label, RBS 1116, contains ten tunes on which he is backed by Islanders Waldo Munro on piano, Duke Neilsen on upright bass, and Warren MacRae on drums. Honey Harbour Two Step - this is definitely a Townsend original. Saint Mary's Polka - This is a different tune than the common Irish polka of the same name. I am unsure of this tune's origin. Saint Francis Reel - A traditional tune found in old Messer collections. It was also recorded by Earl Mitton in the 60's. Mel's Jig - Johnny Mooring composed a tune with this title, but never recorded it. However, as Graham and Johnny were reportedly not the best of friends, I suspect, like the following tune, this jig may have been composed by Mel Lavigne. Rocket Richard Reel - This tune was composed by Mel Lavigne in honour of hockey great Maurice "The Rocket" Richard. For more info on Mel Lavigne, click here. The Butler's Waltz - I suspect this is a Townsend original. The Olympic Two Step - One of Graham's original compositions. The Walker Street Reel - A traditional reel popular in many different traditions. Iris Girl Jig - I believe "Iris" is a typo of "Irish". This tune is more commonly known as "Shandon Bells". The Mouth of the Tobique Breakdown - A traditional tune named for the Tobique River in northwest New Brunswick. Popularized by Don Messer. 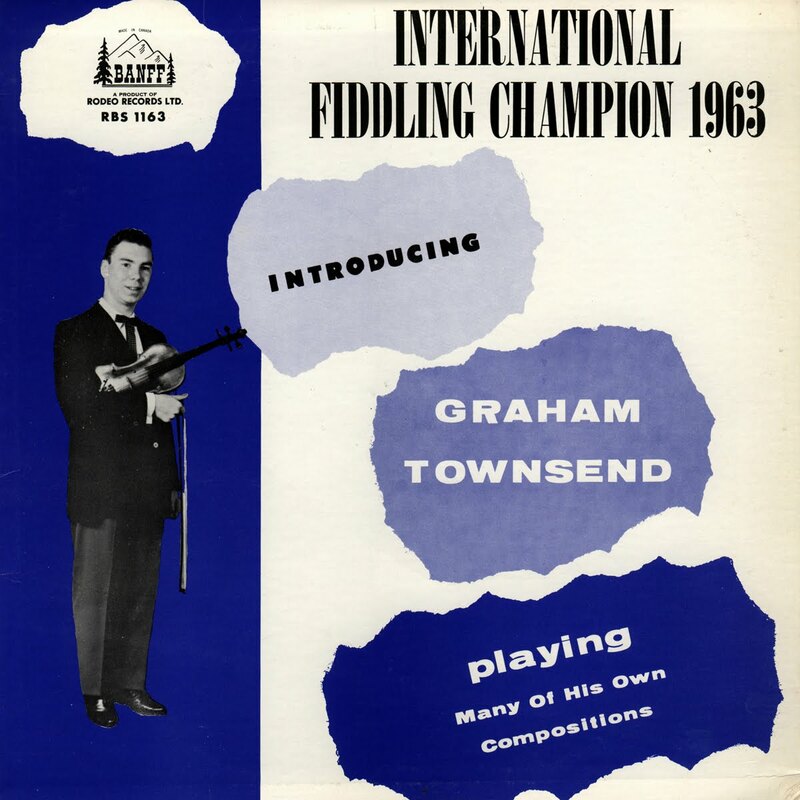 To see Graham participating in a fiddle workshop at the 1991 Shetland Folk Festival, click here. "International Fiddling Champion 1963", Banff RBS 1163 is presented in this post, but the album's name and issue number are somewhat misleading. 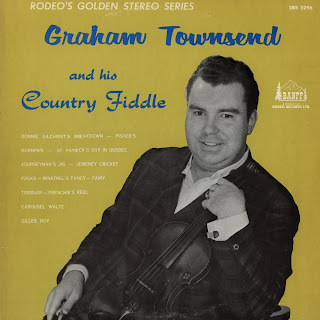 Titled for Graham's 1963 Shelburne win, this is actually a reissue of his first LP, originally released as "Fiddling To Fortune" on Rodeo RLP 44 in 1958. Although I was not able to come up with an image of the original Rodeo jacket, to the best of my memory it was identical to the Banff issue except for the title at the top, and used a burgundy/red/pink colour scheme as opposed to blue. 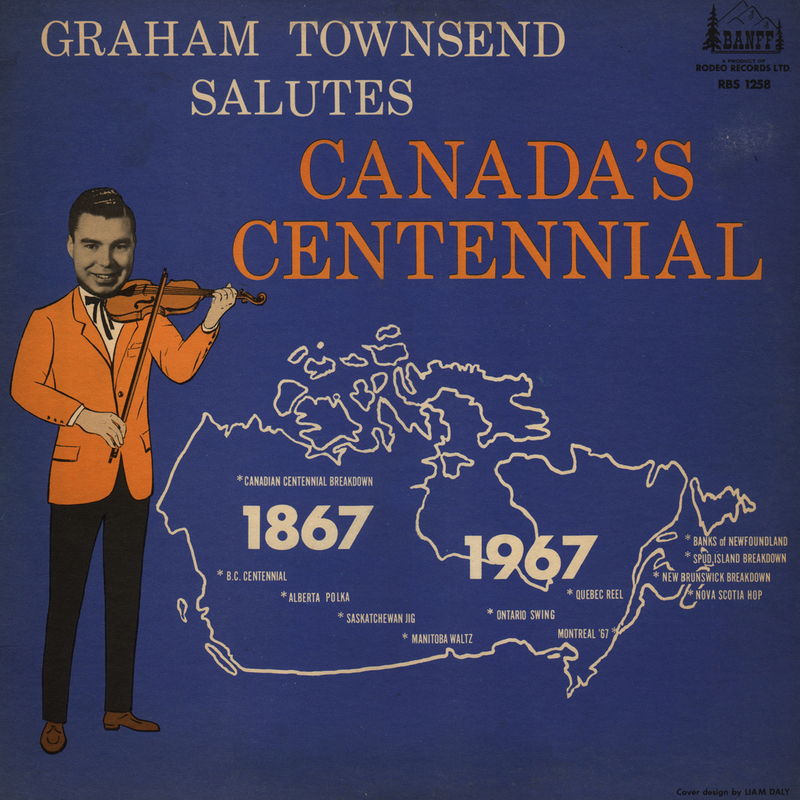 Townsend made this record in Halifax when he was just sixteen years old. His son once told me that Graham was expecting Don Messer's Islanders to be at the session as his accompaniment, but arrived to be informed they were unavailable. The young fiddler was dissatisfied with the group provided, and apparently was never very fond of this album. The accompaniment is steady if not stellar, but Graham's playing already shows a maturity and confidence well beyond his years on the eight originals and four traditional tunes heard here. A very nice 1983 interview of Townsend by Winston Simpson in Miami, Manitoba is here. In it, Graham talks about his early career. Winding our way back through Graham's Banff releases, here's SBS 5239 from 1966. This album is particularly nostalgic for me, as in my youth I had a cassette copy which I nearly wore out in my walkman! It contains ten original Townsend tunes, many of which are his best known, such as "Ice On The Road", "Waltzing Through The Leaves", etc. A great video clip of Graham and Peerie Willie Johnson playing jazz at the 1991 Shetland Folk Festival is here. The contents of two 1960s albums on the Point label comprise today's post. Ed Romaniuk and his sisters Elsie and Anne grew up in Edson, Alberta as devotees of the original Carter Family, whose music came into their home via radio and records. 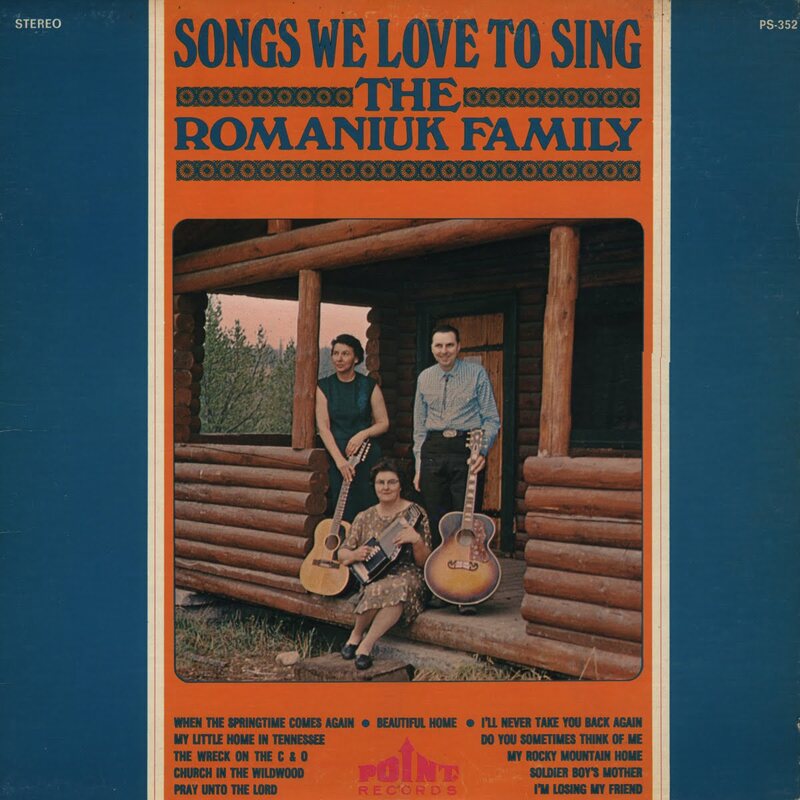 As the Romaniuk children grew up, they played this music themselves, entertaining on local radio, festivals, concerts, etc. They eventually were able to meet their idols, A.P. Carter himself granting their efforts his approval. An account by Ed of he and Elsie accompanying Sara Carter to Memorial Celebrations in Bristol, Virginia in 1971 is included in the notes to a Carter Family LP I previously featured, click here. On each of the two albums, half the songs are traditional Carter repertoire, the other half being Romaniuk originals. The download includes scans of the covers and labels, which include composer credits. I feel I should make mention to followers of the Attic that albums posted here without a scan of the back of the jacket, usually indicate that a generic back slick (often advertising other LPs on the label) was used. Unfortunately, many Canadian LPs were released this way, thus depriving us of any biographical information about the artist. I would like to thank Andyrama for providing access to his copy of "Songs We Love To Sing." Keeping on with the posts of Graham Townsend's Banff albums, here's RBS 1258 from 1967. 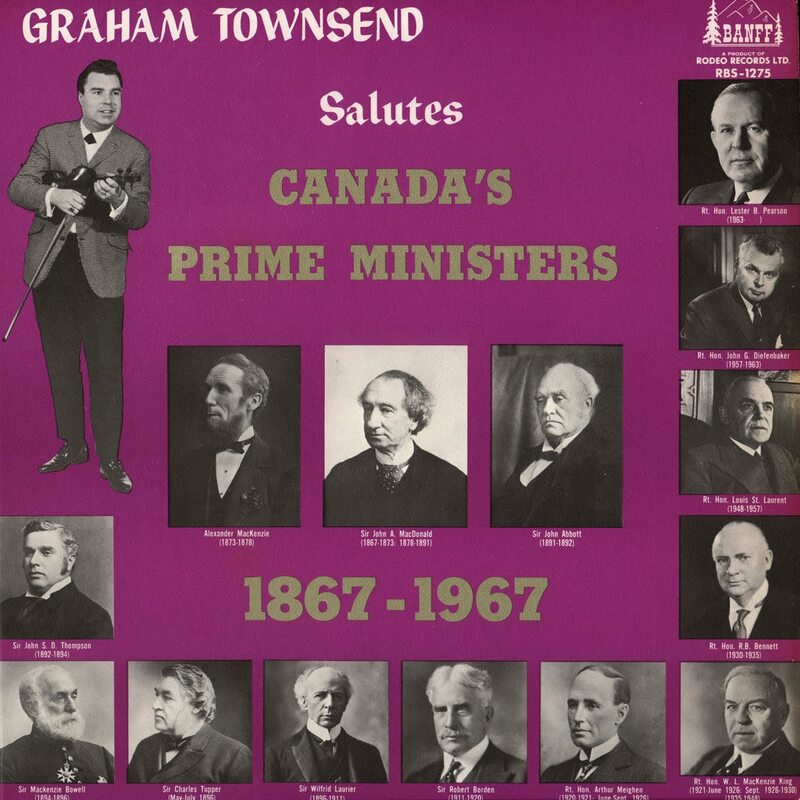 Twelve tunes are featured in honour of the Centennial, each one commemorating a Canadian locale. 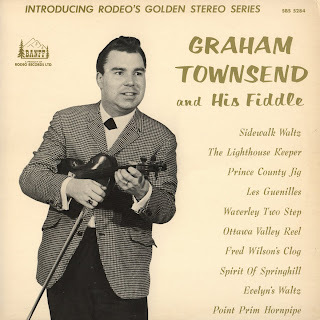 Three are Townsend originals, the balance either traditional or tunes composed by legendary fiddlers Ned Landry, Earl Mitton, Ward Allen, and Cecil McEachern. I would like to thank Andyrama for access to this LP to transfer, and Su for sending me the jacket and label scans. A 1988 live video of Graham playing "Bully of the Town" and the "Clarinet Polka" is here. 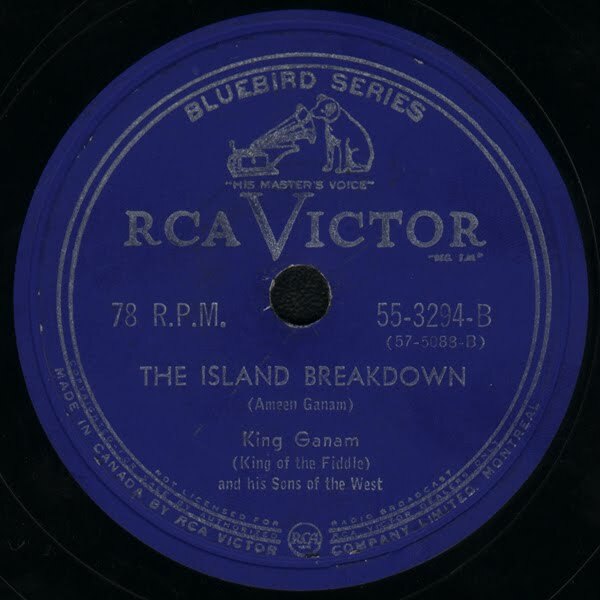 Back in September of last year I posted all the available LP tracks by the late fiddler, King Ganam (click here). While all his albums are comprised of instrumental fiddle tunes, he apparently released some singles featuring vocals as well. 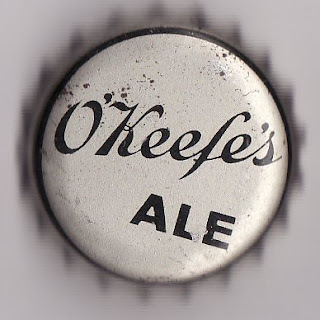 I have been able to track a couple of these rare 78s down, which I am presenting in this post. The first, on RCA Victor's Canadian Bluebird series, contains the song "Forever In My My Heart" which credits Ganam as composer. The vocal is by Pete Vitelli, about whom I can find absolutely no information. The flip side is "The Island Breakdown", a tune which never made it to any of his LPs. I don't have an exact date for this record, but it would be around the mid fifties. 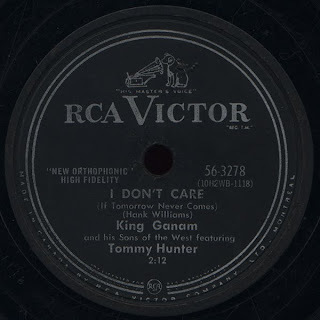 The next 78, on RCA Victor's Canadian 56-3200 black label series (usually reserved for pop material) features two vocal performances by a young Tommy Hunter. Hunter's CBC-TV show ran from 1965 to 1992, and was beyond popular. The Canadian Encyclopedia states that he made his first recordings with Ganam in 1958, so it's a pretty safe bet that these tracks were among them. 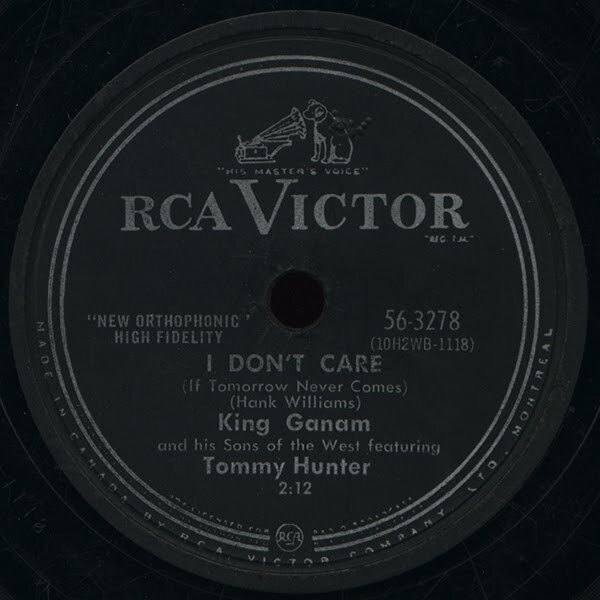 Tommy sings the pop-like ballad "Teenage Love Is A Losing Game" which again is credited to Ganam. It's hard to say if King wrote these songs, or was simply savvy enough to copyright them in his own name. On the flip Hunter performs the Hank Williams composition "I Don't Care (If Tomorrow Never Comes)", originally recorded by Molly O'Day (it can be found here). I would like to thank the Attic's good friends Andyrama and Stephen of Cedar Island for providing access to these records which have allowed me to share some rare vintage Canadian country. To see a video of Graham playing for legendary Ottawa Valley stepdancer Donnie Gilchrist at the 1983 Pembroke, Ontario fiddle contest, click here. A great video of Graham playing a medley of reels at an outdoor festival is here. 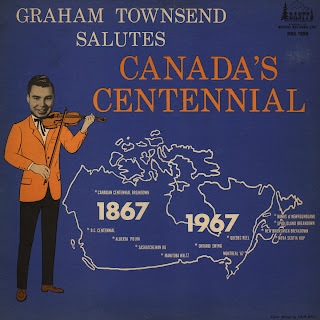 Here is the next of Graham's Banff LPs, SBS 5296, "Graham Townsend and his Country Fiddle" from 1968. The ten track album is comprised of three of his original compositions, two traditional tunes, as well as tunes by Graham's fiddling contemporaries June Eikhard, Al Cherny, Ward Allen, and Andy DeJarlis. 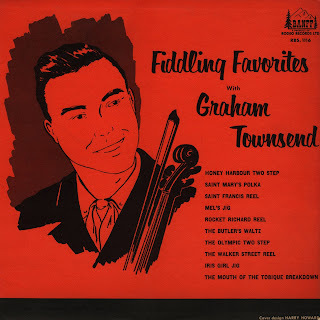 Incidentally, a wonderful video of Graham playing and discussing fiddle styles is here. A little over a year ago I presented "World Champion Folk Fiddler", Banff SBS 5406 (click here), Graham Townsend's last album on Rodeo's Banff line of LPs (he recorded 10 for the label). 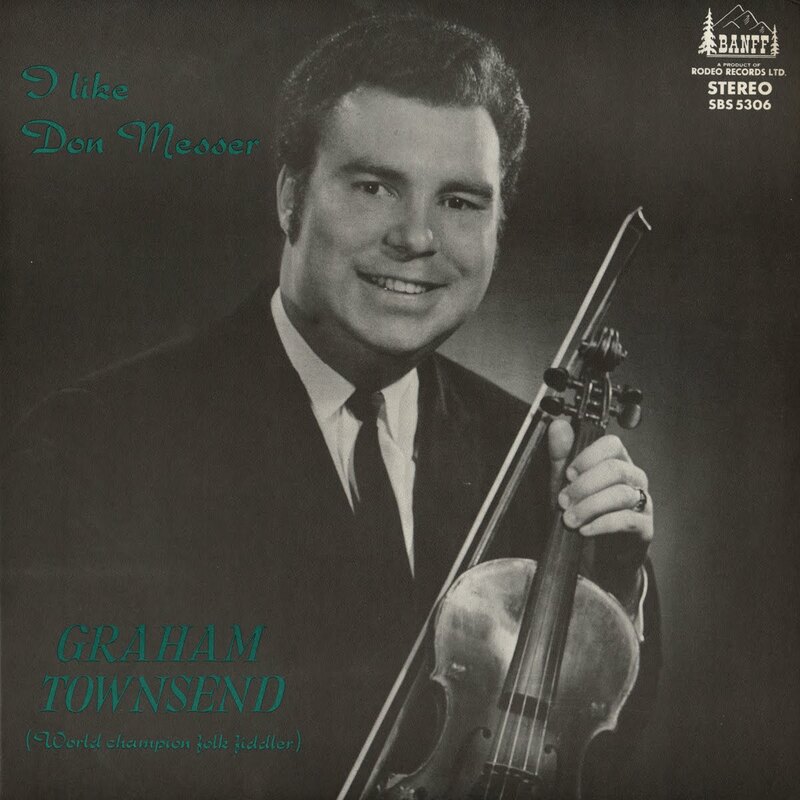 With this post I begin to wind my way back through Graham's Banff output by featuring his 1969 collection, "I Like Don Messer", SBS 5306. On it Townsend plays twelve of Don Messer's signature tunes as only he could. I feel these LPs, especially 5239 onward, are really his seminal recordings. 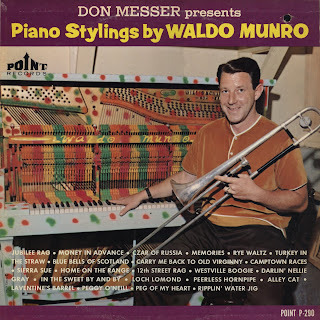 He never made a bad LP, but to me the 1960's Banff LPs really defined his style. 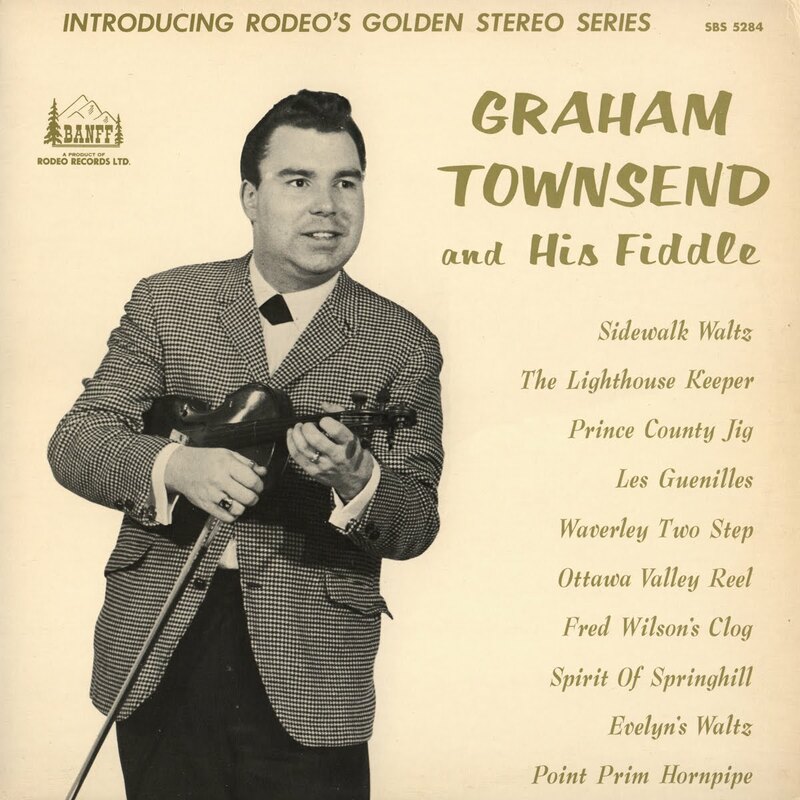 Graham is accompanied here by fellow fiddle great Paul Menard on guitar, singer/producer Dougal (Dougie) Trineer on bass and tenor banjo, and the great Carol Kennedy (now Carol Dawson, wife of fiddler Peter Dawson) on piano. 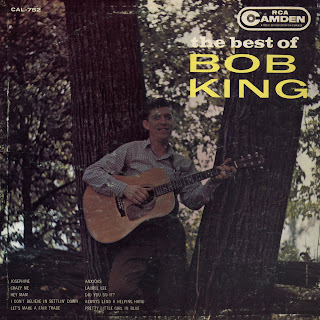 Featured today is a great RCA Camden collection comprised of 10 original 1950's recordings by the legendary Bob King. King (1934-1989) was a successful regional country singer in the Ottawa Valley in the fifties, during which time he was signed to RCA Victor's Montreal division. These fantastic recordings have been out of circulation for years, this LP being the only edition of these tracks other than the original single issues. Some standout tunes are "Josephine", a King original which contains the magnificent line "I'm a singin' hillbilly from Montreal" and "Crazy Me", also an original which was covered by Smilin' Jack Silvers on his Acadia album previously featured here. Perhaps his best work of this era is his original 1954 single of "Laurel Lee" which is reputed to have sold 40,000 copies regionally. Bob's Montreal producer tried to interest the company's Nashville division in his work but to no avail and by the end of the fifties he was recording for George Taylor's Rodeo label, where he made some remakes of his old hits, as well as keeping new singles on the market. 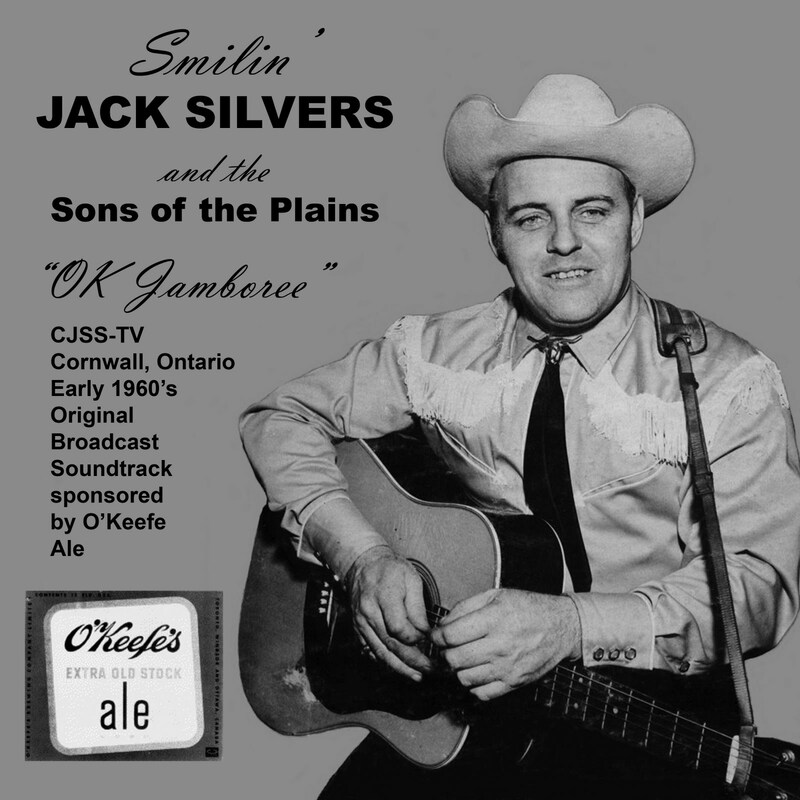 In the sixties he was a member of CFRA Ottawa's "Happy Wanderers", a regional supergroup that broadcast daily and played dates all over eastern Ontario. He continued to record and perform with his wife, French language country singer Marie, until his death. I would like to thank Two Dollar Bill for the use of this rare LP. I have also transferred some of Bob King's post RCA albums for Uncle Gil's Rockin' Archives, click here. 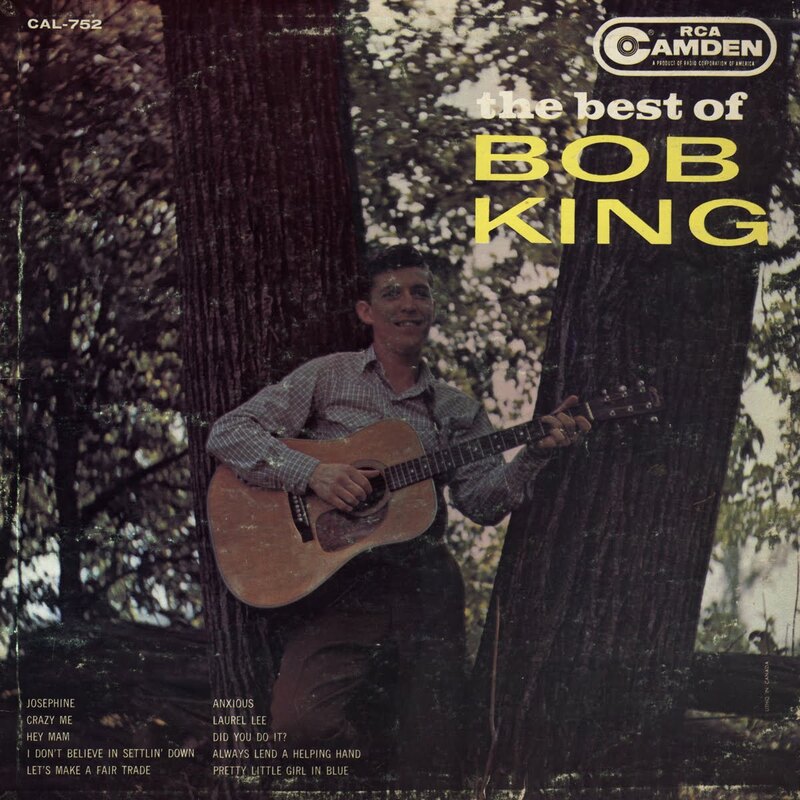 A brief biography of Bob King is here. 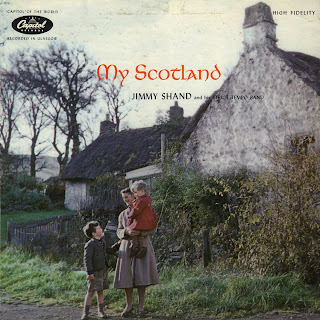 Having enjoyed the previously posted collection of Jimmy Shand recordings immensely, I was happy to come across this LP which I had forgotten was in my collection. 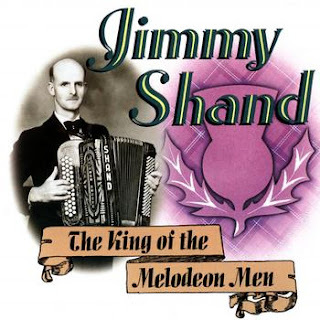 Being a little Shand crazy lately, I decided to transfer and post it as a companion to the "King of the Melodeon Men". One of Scotland's most popular bands makes it's North American debut in this Capitol of the World album. Shand's jaunty accordion solo work and "strict tempo" are showcased on a group of lively Scottish country dance tunes: Merrily Dance (sic) the Quaker's Wife," "Primrose Polka," etc. Authentic Celtic wax for the specialty market. I have long enjoyed the vintage recordings of the great Scottish accordionist Jimmy Shand (1908-2000) and was thrilled to locate this 1994 collection of some of his classic 78's. 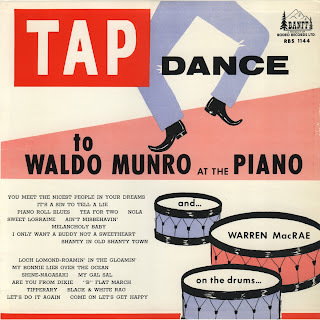 Shand's name is synonymous with the Scottish Country Dance movement, and no doubt dancers have comprised the majority of his record buyers through the years. Nonetheless, I find his recordings, especially his earlier ones, to be fantastic listening. The present compilation contains 21 tracks spanning the years 1934-1954, including 3 of his earliest for Regal-Zonophone, the remainder originally released on the Parlophone label. Shand's career is well documented, a nice bio can be read here. The folder contains all 21 tracks on mp3, as well as a text file with complete tune lists, release number and year for each track. 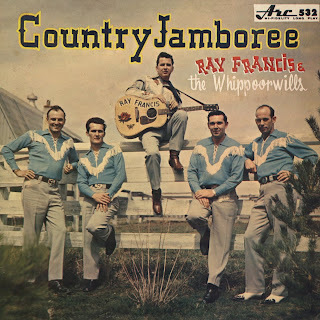 I have presented many vintage albums of great Canadian country music here at the Scratchy Attic, but none gives me as much pleasure to share as these two 1960's LPs by a great band from my hometown of Chatham, Ontario, Ray Francis and the Whippoorwills. Growing up in a "country music family", I often heard my grandparents speak fondly of this band, proudly proclaiming they were "as good as anything out of Nashville". I believe my grandmother even sang a number with the boys on an occasion or two. Many years later I was privileged enough to get to share the stage a few times with the group's steel guitarist, the late Max Dauphin. Francis and his outfit cut two albums in 1963 and 1964, for the Arc and Canatal labels, respectively. The notes to the Arc LP state "As soon as Arc Records heard Ray Francis and The Whippoorwills they immediately recognized that here was one of the most professional sounding country bands in the land." I can only wholeheartedly agree with that statement; I feel that the album is one of the real gems in Arc's early catalog. 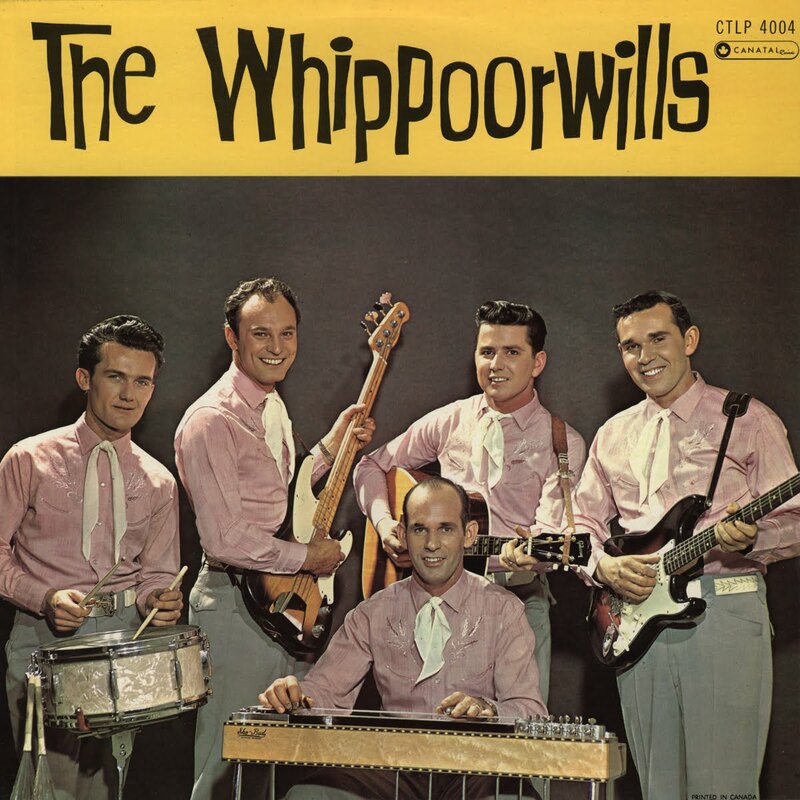 At a time when Canadian recordings tended to be of the "one microphone in a room" variety, the Whippoorwills albums sound balanced and cohesive, unlike many other "local" albums of this period, which while quaint, are often decidedly amateurish. The Whippoorwills were really more a regional than a local band, with some very impressive connections and credentials, as outlined in the articles at the following link to the Chatham Music Archives. 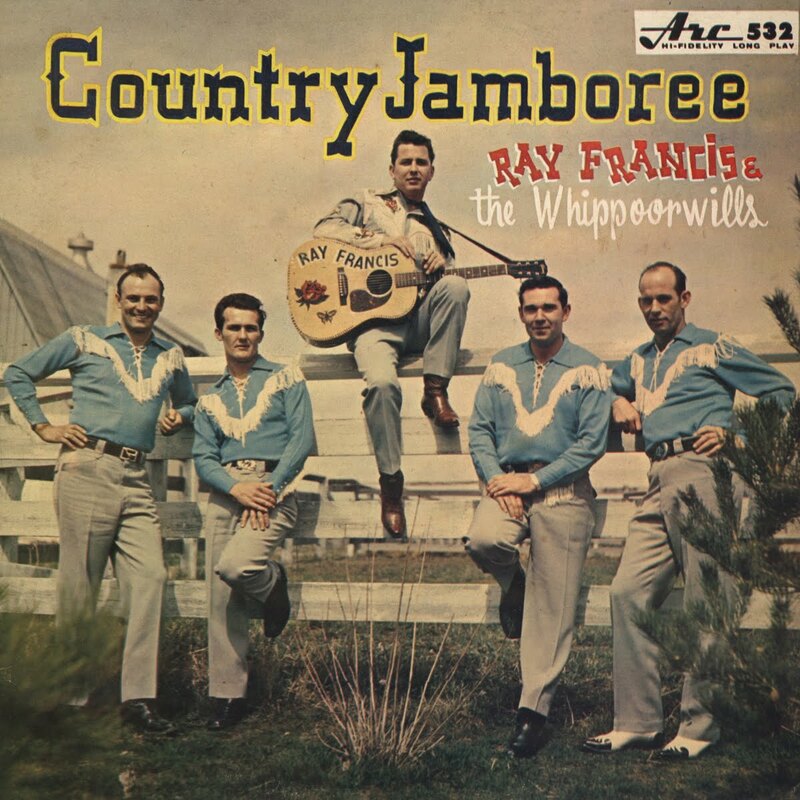 As of 2009, Ray Francis was still active as a musician, and in 2007, the local Chatham newspaper ran a story on his career with the Whippoorwills. A scan of that article is included along with the original LP jackets and labels, and of course the contents of the LPs are downloadeable as mp3s below. The fact that the Chatham area was home to such a great traditional Country band back in the day makes me very proud to be carrying on the tradition of this kind of singing and playing in the present. Kudos to Ray Francis, John Tengelis, Ray Dauphin, Max Dauphin and Bill Taylor for leaving a great legacy! Between McCarthy era testimony, a slew of unbelievably bad 1960's LPs, and Claymation snowmen, it's pretty easy to forget that at one time, Burl Ives was a dynamic and convincing performer of American folk songs. When I picked this 78 album up at a local junk store, the latter day Burl was on my mind and it languished on my shelves for some time. I'm glad I finally gave these discs a spin, though, because they're wonderful. This album of three 78rpm discs was recorded and released by Asch Records (Moses Asch, later to found the Folkways label) in 1944. Asch 78s of this era are notoriously lo-fi and noisy, but enjoyable nonetheless. Incidentally, Columbia released an 78 set by Ives in 1944 with the same title, but comprised of different tunes. These are listed by song title, record number and recording date. 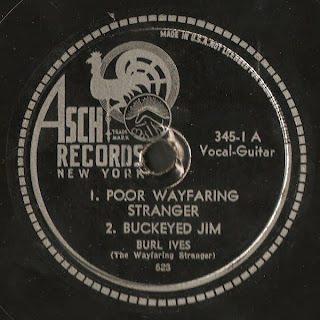 Missing B or A sides of any number have never been re-issued outside the original 78rpm and/or 45rpm release. Most were very topical, for the time, which date badly. Some are gospel songs or just missing. 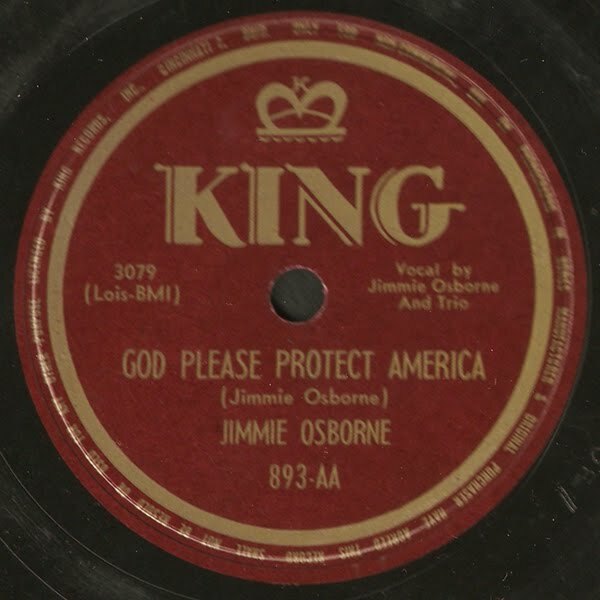 A few songs beyond the 49 here in 1954 and 1955 were never re-issued at all and probably only saw very limited release (1000 copies total or less) to fulfill the contract between King and Mr. Osborne which ran 7 years. Jimmy Osborne was a minor country star, who put out some pleasing recordings, but while he had regional followings, he couldn't latch on to the "Big" one. I don't know why. He was at WLS, KWKH, WLW on their radio & TV shows, but never caught on there. He was mostly a low paid radio D.J. and when his King contract ended at the beginning of the rockabilly/rock-n-roll era, his career was essentially over in country music. When you listen to these songs, the melodies on some may sound familiar. Reason being is while Osborne wrote the lyrics to a lot of his songs, he "borrowed" heavily from previous songs for the melodies. Some more than others. 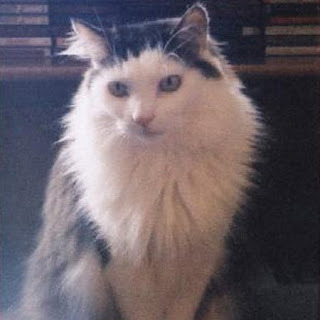 Many thanks to Bobsluckycat, who's lucky cat, Mr. Lucky, is pictured below! Please note that due to size, the 49 files have been split into two folders. The little 45rpm disk pictured here is another total mystery. I purchased it about five years ago in a thrift shop in Wallaceburg, Ontario. It contains two great country tunes by one Jimmy Williams, with both of the compositions credited to Hank Martin. I'm assuming the "JW" tag for both the label and publishing company is a reference to Mr. Williams. The only other info shown is "W. Cutcher/R. Jacoby Productions", with no indication of a date or locale on the label. 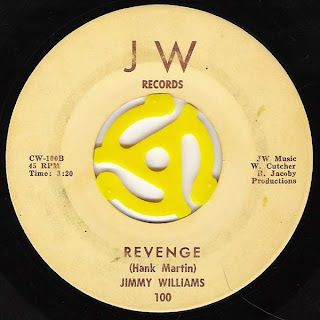 I have no idea who either Williams or Martin are; I'm pretty certain this is not the Jimmy Williams that recorded with Red Ellis on Starday. I have been unable to find any reference to this record online, as you can imagine, there are many people who go by these names! The "a" side, "Two's A-Plenty - Three's A-Crowd" is fairly uptempo, while the flip, "Revenge" is a good deal slower, and a pretty convincing honky-tonk "weeper". The recording quality is somewhat raw and lo-fi (the brief tape drop-out on the second side is on the actual disk), but I find this record very enjoyable. Williams is a good, if not especially technical, honky-tonk singer, and the harmony on the choruses adds a lot to these performances. To my ears the sparse rhythm section consists of acoustic rhythm, electric bass, and snare, with the vocal driven along by an incessant but tasteful steel player. 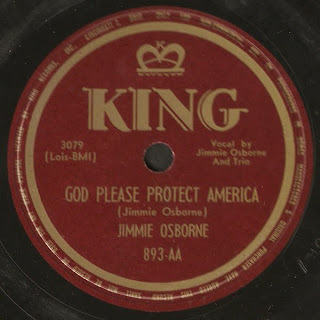 I recently went looking around the blog-sphere to see if I could find any Jimmie Osborne albums, and alas, no luck. I therefore decided to remedy the situation by presenting this LP on King's Audio Lab label. This dinner plate of a disc was issued in 1959, and features twelve tunes composed and performed by the late Kentucky singer. 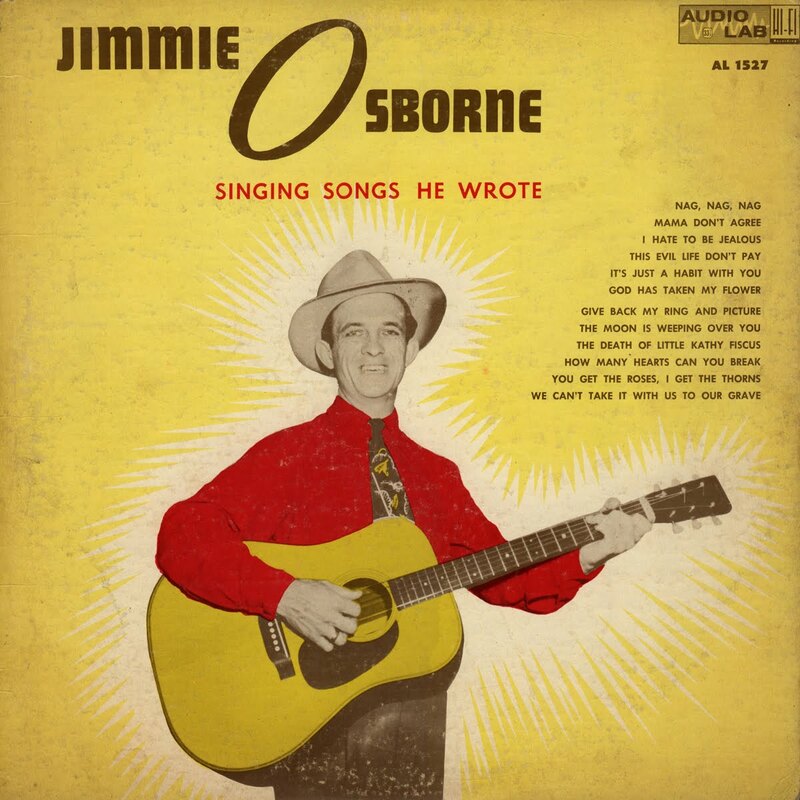 This is great postwar southeastern country music, Osborne's style is reminiscent of of Acuff, the Bailes Brothers, Hank Williams, etc. 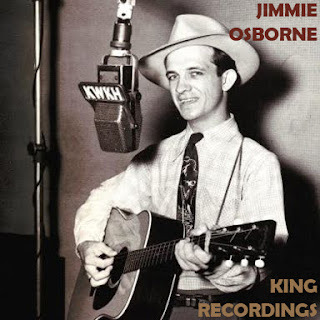 Unfortunately, Jimmie commited suicide in 1957 and is not as well remembered he should be. 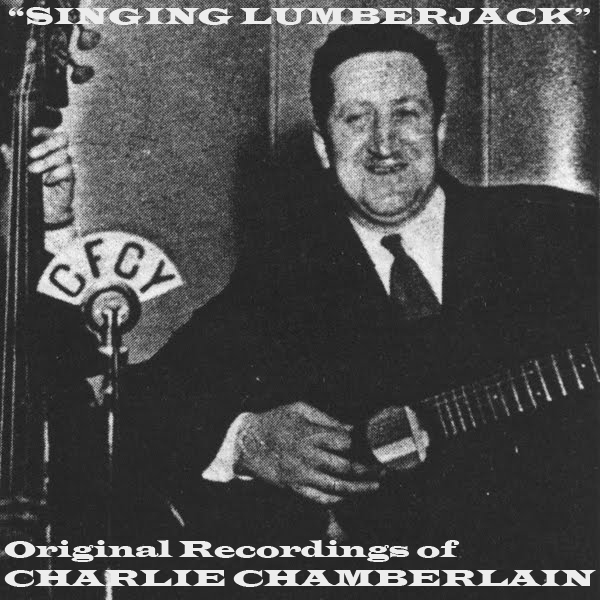 Today marks the 39th anniversary of the passing of Don Messer's legendary "Singing Lumberjack", Charlie Chamberlain. He passed away July 16, 1972, just two days after his 61st birthday, the 14th also marked the hundredth anniversary of his birth. At the time of his death, he had broadcast with Messer on radio and later television for over 40 years, and to Canadians was a larger-than-life legend. As such, Charlie has become an almost mythical figure, about whom many anecdotes circulate, some more borne of reality than others. Chamberlain was born in Bathurst, New Brunswick in 1911. His mother was widowed early and to assist, Charlie went to work in the lumber woods at the age of eight. In this setting he became an strong and extroverted youngster who was eager to entertain. During WWI, he allegedly sang to the soldiers on passing troop trains, who would throw coins in appreciation. 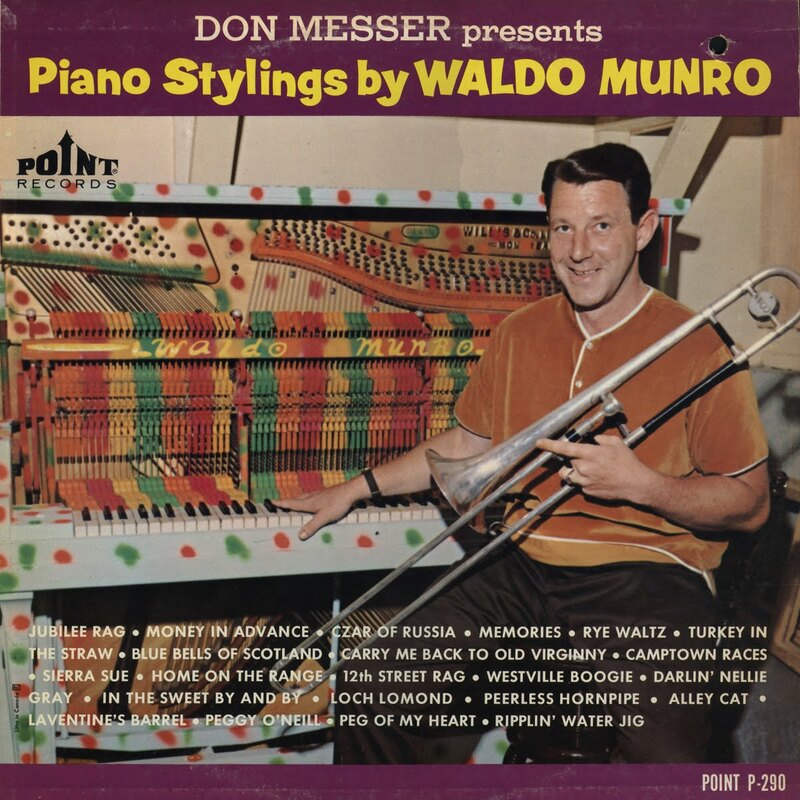 While riding a train himself, a friend of Don Messer's heard Charlie warbling, and put him in touch with the radio fiddler who was looking for a vocalist. Thus began the mutually beneficial association that made Canadian musical and broadcasting history. Charlie Chamberlain performed pretty much exclusively with Messer for the rest of his career. 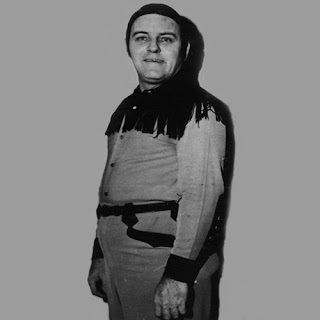 Chamberlain is most often recalled as an incredible character, a true "Good Time Charlie". A huge man with huge appetites, he seems to have lived his life "in the moment". Charlie preferred to receive his pay from Messer in cash, even asking for small bills which were easier to spend. He was notoriously generous, and quite freely shared his money with friends and neighbours, and although he was one of Canada's most loved and recognized entertainers, he always kept a day job. During the sixties, when Don Messer's Jubilee was pretty much the highest rated TV show in Canada, many a motorist was shocked to have Charlie pump their gas at a service station in Lakeside, NS. Modern accounts of Charlie often imply his talent was more as an entertainer than a singer, and by the TV years, which are most remembered, the years of hard living had definitely taken a toll on his voice. 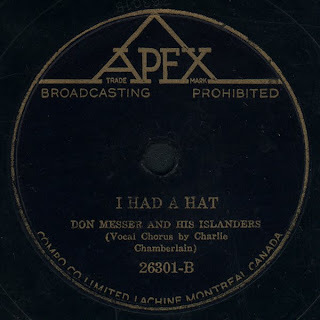 The early recordings here, however, show that in his prime, Chamberlain was a formidable radio crooner. I have always felt that the Don Messer band in the thirties and forties was sort of like a northeastern equivalent to what Bob Wills was in the southwest; a popular dance band rooted in the local fiddling tradition that nonetheless could play whatever dancers might request, modern or otherwise. This makes Charlie a hard singer to peg genre-wise, here he sings pop of the day, western songs, and a great deal of Irish novelty material. 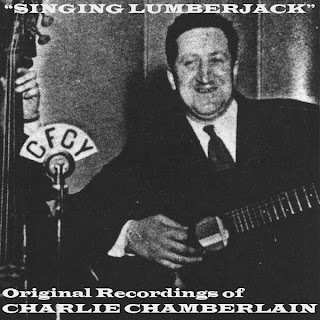 Unfortunately, there seems to be no recordings in circulation of the many lumberjack ballads for which Charlie was noted in his early radio years. 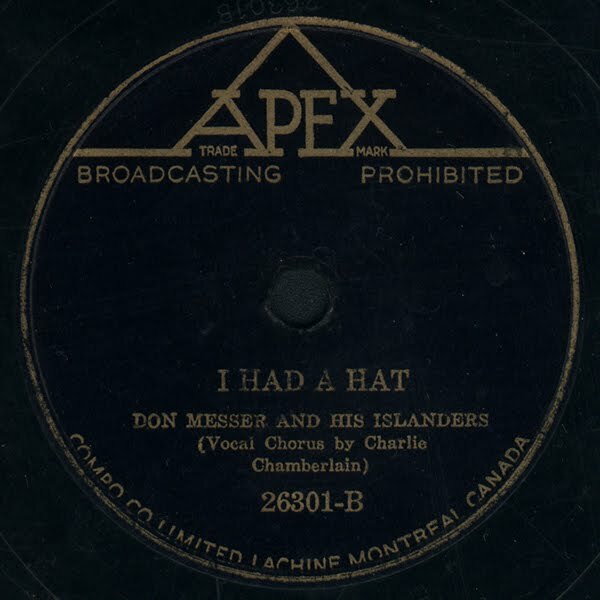 Tracks 1-12 in this collection are drawn from 1940s Apex label 78s and radio transcriptions, and track 13 is a 1958 radio performance. Chamberlain is backed on these by Don Messer and his Islanders. Tracks 14-23 are the contents of Charlie's only solo LP, a collection of Irish songs first issued in 1967 on the Point label (reissued in the 70s on MCA Coral, shown below). The final track is a solo performance from a 1967 LP of hymns with Marg Osburne. On the LP tracks, Charlie is accompanied by Rae Calder at the organ. On a personal note, I really enjoy the 78 era stuff the most, in particular "Swinging To The Rhythm Of An Irish Jig", about swing music taking over at the local ceilidh(! ), and "I Had A Hat", which cleverly interpolates Miss McLeod's Reel and the Irish air Port Láirge (sometimes called "Rose Tree") in a 1940s pop context. I would like to thank Andyrama for the use of a rare Messer promo LP from which "The Broken Down Piano" and "Goin' Back" were sourced. Incidentally, there are many great clips of Charlie on YouTube. A couple of favourites are a series of National Film Board vignettes, one of which is here, and a take from Don Messer's Jubilee of Charlie performing Acadian mouth music while Don fiddles "The Old Man and The Old Woman", seen here. 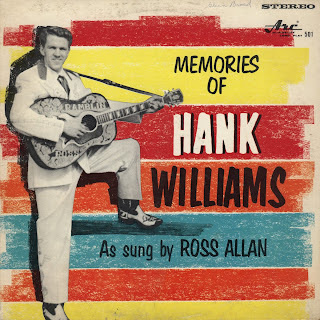 Featured today is a piece of Canadian country music history, the first LP ever issued on the Arc label's early 500 series, "Memories of Hank Williams as sung by Ramblin' Ross Allen" (spelled "Allan" on the cover, but "Allen" on the label and back slick). Arc Sound Ltd. was a producer of amps and P.A. equipment originally located in the Toronto suburb of Scarborough. In the late fifties they began to dabble in record production, turning out several cheap "top hits" type LPs. 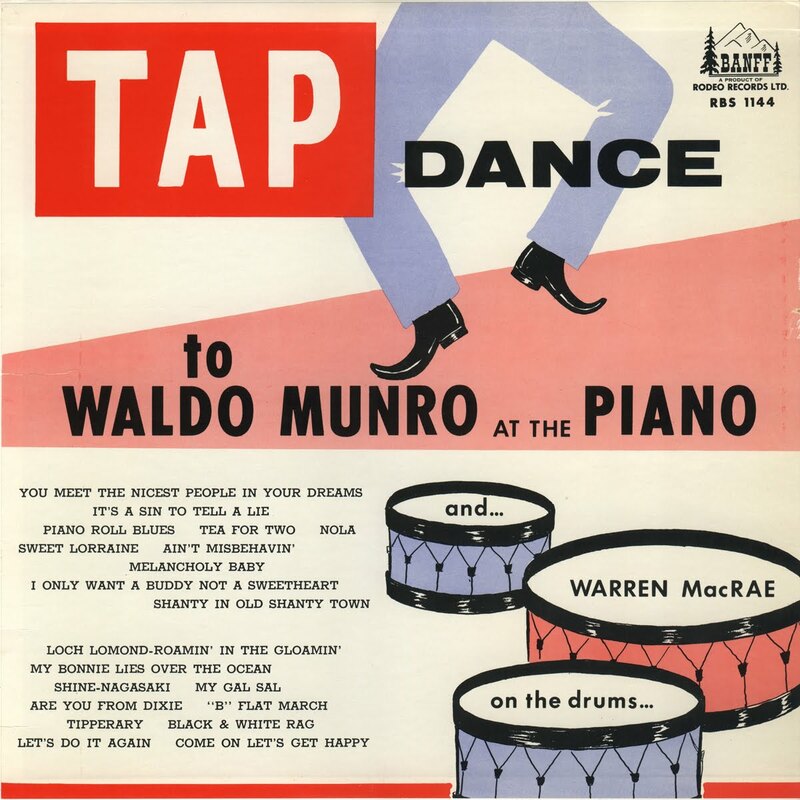 The release of the this album in 1959, however, marked the beginning the Arc label in earnest; it was the first in a decade long series of productions which were for the most part recorded in Toronto utilizing local talent. A majority of these, especially the earlier ones, were country. 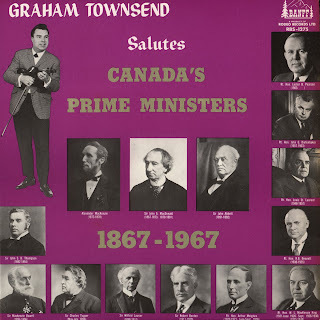 The albums recorded during this time have preserved the music of several Canadian country artists that would otherwise would be lost to the ages; the type of performers who while not national stars, would have had followings on regional radio or TV and in clubs. 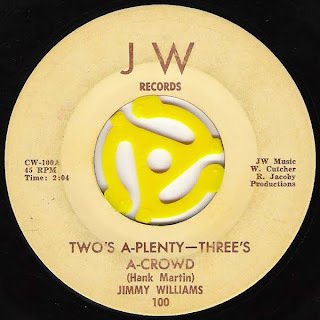 Arc also released many country albums by Americans who were popular and toured in Canada, including many artists featured on WWVA's Wheeling Jamboree (from Wheeling, West Virginia), heard extensively in Eastern Canada. Unfortunately, I have very little information regarding Ramblin' Ross Allen. 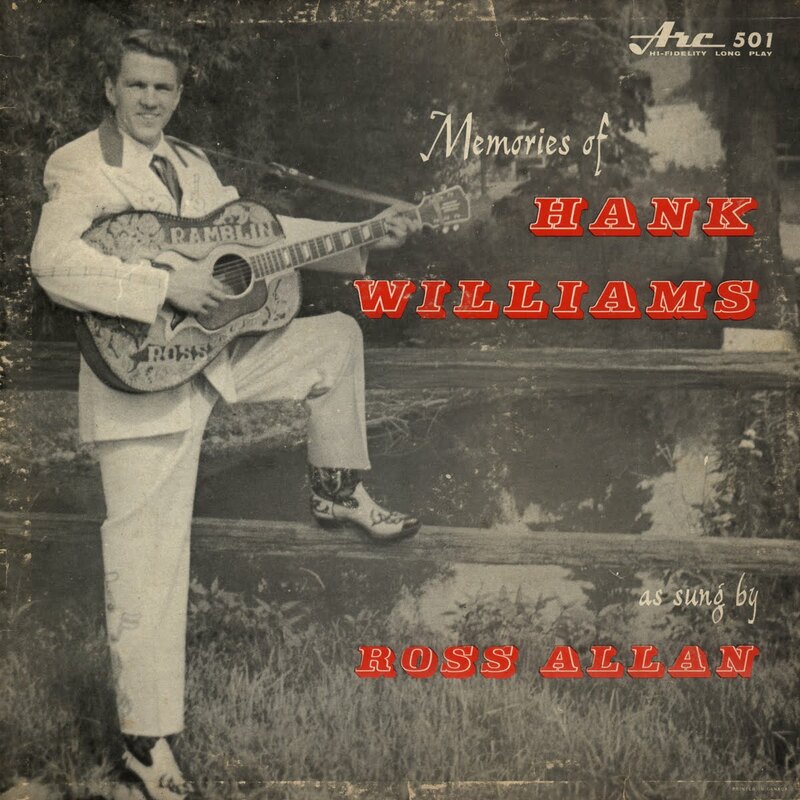 Unlike many Arc LPs which at least provide a locale of origin for the artist, the notes to this LP only state that "Ross Allen is one of the most promising young Country singers today." An online source provides a birth date of February 27, 1937, and he also had a self titled LP as well as some singles released on the London label. Otherwise, he is somewhat enigmatic. If anyone can provide more information on Ramblin' Ross, please contact me and I'll post it. The present download contains the twelve LP tracks, as well as jacket and label scans including the 2nd edition of the jacket (most of the earliest Arc albums were later released with more "colourful" covers) shown below.